There is much speculation about whether Representative Anthony D. Weiner will remain in Congress or resign his seat. But there is a politically expedient solution for Democrats if they want to show him the door: Neuter his district in the redistricting process, which will require New York to lose 2 of its 29 seats in the House of Representatives. No discussion of redistricting is simple, especially in New York, so some background is in order. Mr. Weiner’s seat, the Ninth Congressional District, is the second most conservative in New York City, after the 13th (Staten Island and part of Brooklyn). Conservative, of course, has a relative meaning in the context of New York — the Ninth District remains Democratic-leaning — but it has become much more competitive than might have been expected. Surrounding districts remain staunchly Democratic, though, giving Barack Obama between 63 and 91 percent of their votes in 2008. The 2010 census dictates that New York State’s Congressional districts include a population of 717,707 on average, and the Ninth’s current borders encompass only 660,306 residents. There is almost no way to add the necessary 57,000 residents — roughly 9 percent of its current population — from neighboring districts without also making the Ninth more Democratic than it is now. So while the district could be competitive if an election were held using the current boundary lines (for example, in the case of a special election later this year), it is less likely to be competitive in 2012 after the boundaries are redrawn. Of course, the present Ninth District could itself be carved up and its population used to beef up neighboring districts. That would be fairly sure to cost the Democrats a seat. But with the two parties sharing power in Albany and each holding a veto over the redistricting process, it is probably inevitable that one of the two seats the state loses will be a Democratic-held one. 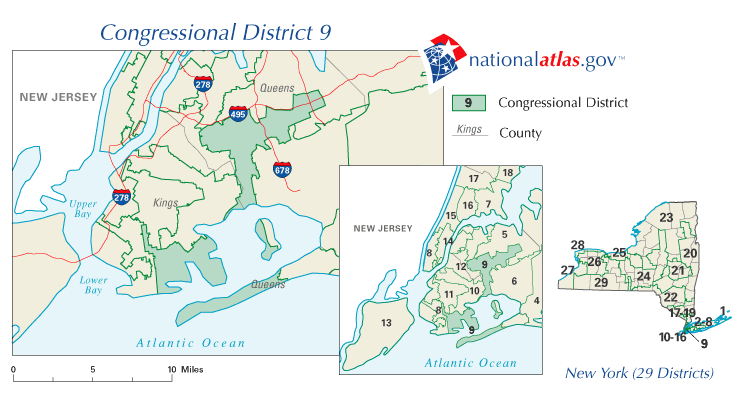 If they must lose a seat, the Ninth might be an attractive option for Democrats, both because it is the only one they now hold in Brooklyn or Queens that would be vulnerable with a poor Democratic candidate or in a strong Republican year, and because it is centered in an area with relatively slow population growth. 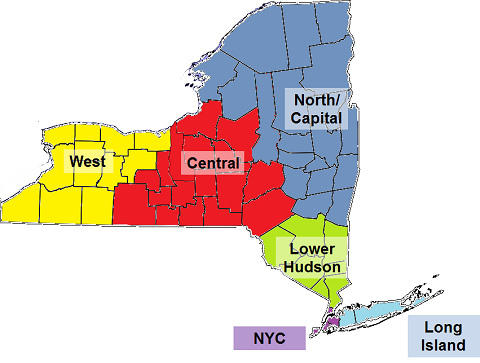 In the chart below, I’ve detailed the population shifts in different regions of New York State, as well as the attendant changes in the number of Congressional districts that they require. Although New York City grew at the same rate, 2.1 percent, as the rest of the state between 2000 and 2010, the number of Congressional districts it can support has declined from 12.2 to 11.4 because of the overall reduction in the state’s allotment. The slowest growth in New York City has been in Brooklyn and Queens, which together added just 0.9 percent to their populations over the past decade. In other words, it Mr. Weiner’s seat isn’t dissolved, that of another Brooklyn or Queens Democrat might have to be broken up instead. Plausible candidates include the Fifth District in northeastern Queens and northwestern Nassau County on Long Island (Gary Ackerman’s seat), and the 11th District in central Brooklyn (Yvette Clarke’s seat), which is significantly underpopulated. Some analysts have suggested that Carolyn McCarthy’s seat, the Fourth District in Nassau County, might be carved up instead, but that is a less natural division, since Long Island’s suburban population has grown enough to still warrant four full districts. Another alternative, suggested by Aaron Blake of The Washington Post, would be to reverse New York State’s usual polarity, and eliminate an upstate Democrat and a downstate Republican. The problem would lie in finding the appropriate victims — particularly the downstate Republican. Only one Republican, Michael Grimm of the 13th District, represents any part of New York City in Congress. But there only limited scope to tinker with his district. Staten Island, which has enough residents for about two-thirds of a seat, has a strong local identity, and any new map that sought to divide it among several districts would be likely to incite both popular anger and legal challenges. Pairing conservative-leaning Staten Island with some particularly Democratic-leaning portions of Brooklyn — say, a majority-minority neighborhood like Sunset Park — could potentially tip the district’s party leaning from slightly Republican to slightly Democratic. But it would be hard to make the district sufficiently more Democratic to deny Mr. Grimm a chance of holding the seat as a Republican incumbent. Long Island’s only Republican representative is the bombastic Peter T. King, whose Third District is underpopulated and will need to add more than 70,000 constituents. But its surroundings are merely Democratic-leaning, rather than solidly Democratic, and Mr. King has a long history of overperforming at the polls. So a similar problem emerges: Democrats could make Mr. King’s re-election bid more difficult with new boundaries, but probably not deny him a seat — there are too many Republicans living there to create four strongly Democratic districts. The next-closest thing to a “downstate” Republican is Nan Hayworth, a freshman representing the 19th District in the lower Hudson Valley. But that seat’s population has grown at a healthy clip, and it is not close enough to New York City or Long Island to serve the goal of reducing the number of seats in those regions. Finding an upstate Democrat’s seat to sacrifice would be less challenging, particularly in the western part of the state, which is badly underpopulated now. But perhaps the most natural target — the 26th District, won by Kathy Hochul in a special election last month — might draw objections from both parties: from Democrats because they think she’s a rising star after her upset victory, and from Republicans because they expect to have a reasonable chance of reclaiming the seat anyway. Unless Mr. Weiner resigns immediately and a Republican wins the resulting special election — in which case Ms. Hochul and the newly minted Republican might be a natural trade — the pressure therefore remains on the Democrats of Brooklyn and Queens. That is not to say that eliminating Mr. Weiner’s seat would be easy; redistricting never is. “I suspect there would be a lot of people in various Brooklyn and Queens Jewish communities who would howl at eliminating the Ninth,” I was told by David Wasserman of the Cook Political Report, perhaps the nation’s foremost redistricting expert. And Mr. Weiner himself, of course, will also raise objections, if he survives his scandal. Even a neighboring district is broken up to preserve the Ninth, though, that still would leave an unemployed Democrat who could challenge Mr. Weiner in a primary. Such a challenge is not sure to succeed: Rep. Charles B. Rangel of Harlem, who had deeper ethical problems than Mr. Weiner, managed to survive a multiway primary challenge with surprising ease last year. But it is precisely because Democratic seats in New York City are hard to lose that they are such valuable commodities. The likelihood that there will be one fewer of them next year makes them scarce commodities, too — and Mr. Weiner is unlikely to get a free pass, however the new boundaries are drawn.